Manufacturer of a wide range of products which include maple sports wooden flooring and volleyball court airpass wooden flooring. Our collection of products consists of high quality Maple Flooring made from the most standard material available in the industry. We offer these floorings for Badminton, Squash and Basketball courts, according to client specifications within the stipulated time frame. Made by using the most advanced technology this item is provided after conducting stringent quality testing procedures, to ensure flawless delivery to our customers at the most affordable rates. We are known as one the most highly regarded players in the market due to our use of industry grade components and deft engineers as our support team. 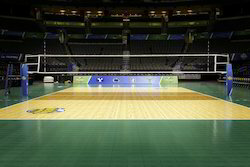 Our offered Volleyball Court Airpass Wooden Flooring is an exclusive range of wooden floor that is highly reliable and most importantly this effortlessly lets the air pass ensure adequate moisture to enhance the performance of the Volleyball players. Size: 100 x 32 mm, 125 x 23 mm, 140 x 25 mm, 146 x 23 mm, 146 x 25 mm, 150 x 25 mm, 150 x 20 mm 250 x 25 mm etc. Surface: One side flat, the other side with grooves, two sides using.